Submitting forms and account agreements to the Utah Educational Savings Plan (UESP) just became easier for financial advisors who use DocuSign for electronic signatures. The forms can be found at beta.advisor.my529.org under Materials. For security purposes, a DocuSign Certificate of Completion authenticated with knowledge-based LexisNexis verification must be included with the forms. No other e-signature verification methods or companies are available at this time. Advisors and firms who are DocuSign customers may use it to submit forms. For more information about DocuSign, visit docusign.com. 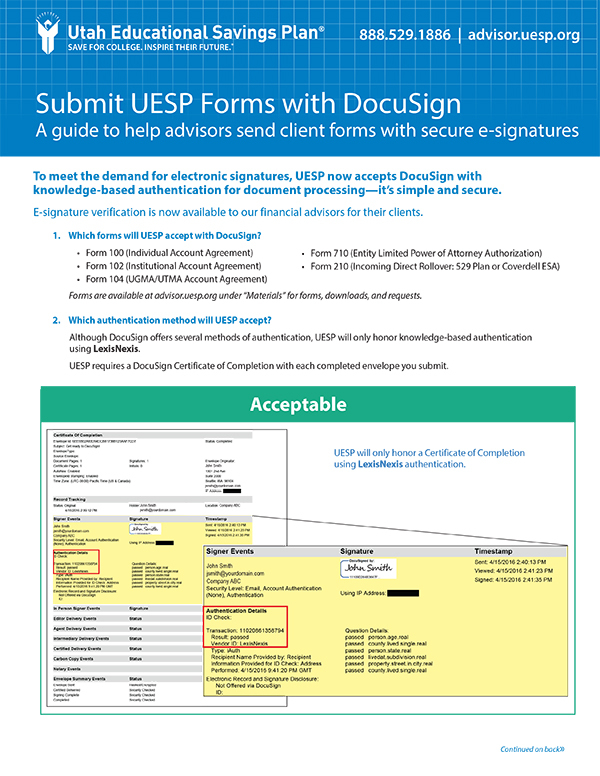 View our PDF guide for UESP’s DocuSign acceptance criteria. Contact the Professional Services Team with any questions via phone at 888.529.1886 or email at advisorinfo@uesp.org.